Active learning allows you to improve the quality of your knowledge base by suggesting alternative questions, based on user-submissions, to your question and answer pair. You review those suggestions, either adding them to existing questions or rejecting them. Your knowledge base doesn't change automatically. You must accept the suggestions in order for any change to take effect. These suggestions add questions but don't change or remove existing questions. QnA Maker learns new question variations with implicit and explicit feedback. Implicit feedback – The ranker understands when a user question has multiple answers with scores that are very close and considers this as feedback. 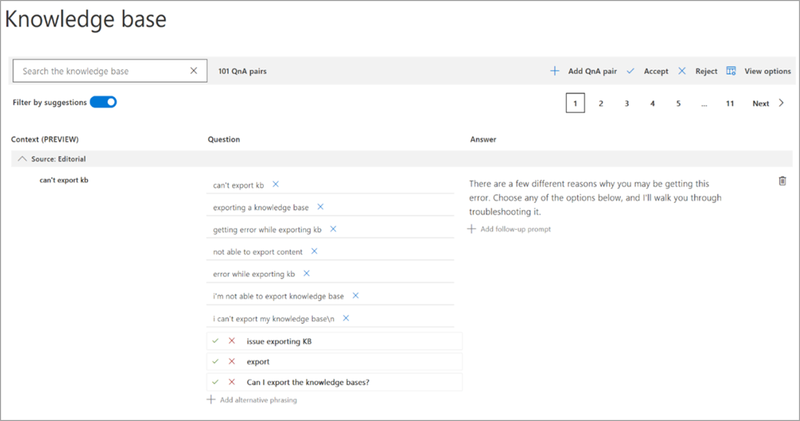 Explicit feedback – When multiple answers with little variation in scores are returned from the knowledge base, the client application asks the user which question is the correct question. The user's explicit feedback is sent to QnA Maker with the Train API. Either method provides the ranker with similar queries that are clustered. Active learning is triggered based on the scores of top few answers returned by QnA Maker for any given query. If the score differences lie within a small range, then the query is considered a possible suggestion for each of the possible answers. All the suggestions are clustered together by similarity and top suggestions for alternate questions are displayed based on the frequency of the particular queries by end users. Active learning gives the best possible suggestions in cases where the endpoints are getting a reasonable quantity and variety of usage queries. When 5 or more similar queries are clustered, every 30 minutes, QnA Maker suggests the user-based questions to the knowledge base designer to accept or reject. Once questions are suggested in the QnA Maker portal, you need to review and accept or reject those suggestions. Active Learning is supported in runtime version 4.4.0 and above. If your knowledge base was created on an earlier version, upgrade your runtime to use this feature. For best practices when using active learning, see Best practices. When a question's score is highly confident, such as 80%, the range of scores that are considered for active learning are wide, approximately within 10%. As the confidence score decreases, such as 40%, the range of scores decreases as well, approximately within 4%. The algorithm to determine proximity is not a simple calculation. The ranges in the preceding examples are not meant to be fixed but should be used as a guide to understand the impact of the algorithm only. Active learning is off by default. Turn it on to see suggested questions. Select Publish to publish the knowledge base. Active learning queries are collected from the GenerateAnswer API prediction endpoint only. The queries to the Test pane in the Qna Maker portal do not impact active learning. To turn active learning on, Click on your Name, go to Service Settings in the QnA Maker portal, in the top-right corner. Find the QnA Maker service then toggle Active Learning. In order to see the suggested questions, on the Edit knowledge base page, select Show Suggestions. Filter the knowledge base with question and answer pairs to show only suggestions by selecting Filter by Suggestions. Each question section with suggestions shows the new questions with a check mark, ✔ , to accept the question or an x to reject the suggestions. Select the check mark to add the question. Select Save and Train to save the changes to the knowledge base. Select Publish to allow the changes to be available from the GenerateAnswer API. When a question is too close in score to other questions, the client-application developer can choose to ask for clarification. "Turn Wi-Fi On or Off"
The client application displays all the questions with an option for the user to select the question that most represents their intention. Once the user selects one of the existing questions, the client application sends the user's choice as feedback using QnA Maker's Train API. This feedback completes the active learning feedback loop. Use the Azure Bot sample to see active learning in an end-to-end scenario. URL route parameter Knowledge base ID string The GUID for your knowledge base. 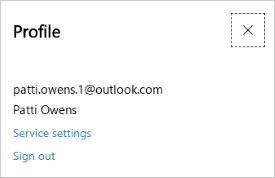 Host subdomain QnAMaker resource name string The hostname for your QnA Maker in your Azure subscription. This is available on the Settings page after you publish the knowledge base. Header Authorization string Your endpoint key (EndpointKey xxxxxxxx-xxxx-xxxx-xxxx-xxxxxxxxxxxx). feedbackRecords array List of feedback. userId string The user ID of the person accepting the suggested questions. The user ID format is up to you. For example, an email address can be a valid user ID in your architecture. Optional. userQuestion string Exact text of the question. Required. qnaID number ID of question, found in the GenerateAnswer response. A successful response returns a status of 204 and no JSON response body. When your app has active learning enabled, and you export the app, the SuggestedQuestions column in the tsv file retains the active learning data. When you reimport this app, the active learning continues to collect information and recommend suggestions for your knowledge base.